While in the attic recently, I came across several of my old posters. When I was in college and working at a comic book shop, these things plastered the walls of my apartment. They were everywhere! Nowadays I only have comic posters hanging in my Comicatorium. So I decided these old posters needed to see the light of day one way or another. Therefore, for the next few days you get to stroll through my poster collection. Today we’ll look at some of my DC Comics related posters. Please ignore the magnets in the corners of these posters. I used them to hold the poster in place while I took the photos. Enjoy! The following poster of Batman’s rogue gallery was drawn by Joe Quesada (now Marvel’s Editor-in-Chief). Besides Quesada’s amazing artwork, I’ve always liked the disorienting perspective. 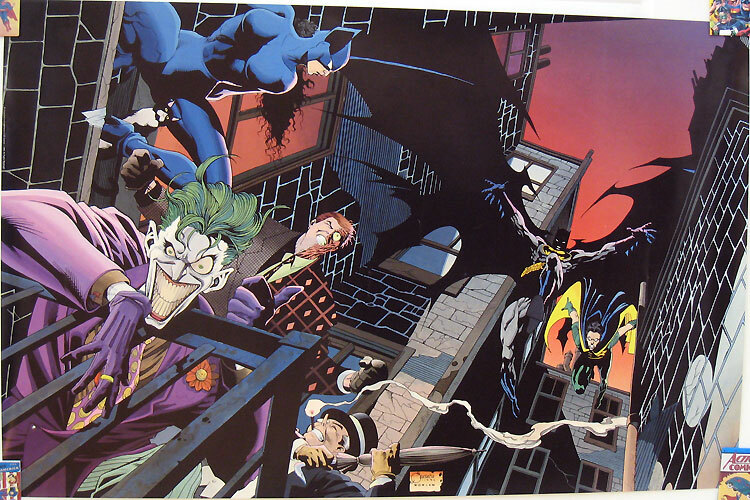 This image originally appeared as the cover to The Batman Gallery cover dated 1992. Click the image to enlarge. 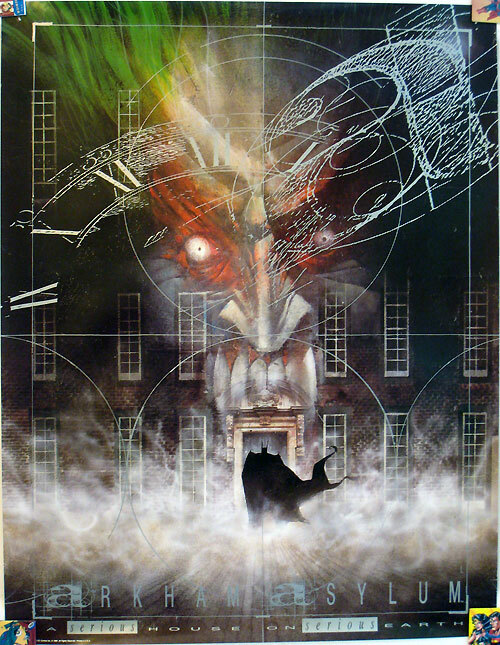 The following Dave McKean poster of Grant Morrison’s 1989 masterpiece Batman: Arkham Asylum has been used more recently on the cover of the 15th anniversary trade paperback. This poster was issued around the time of the original release in 1989. Really awesome and creepy poster! Also worth noting is that the silver lines and images in the forefront were done in silver reflective ink. Pretty cool. 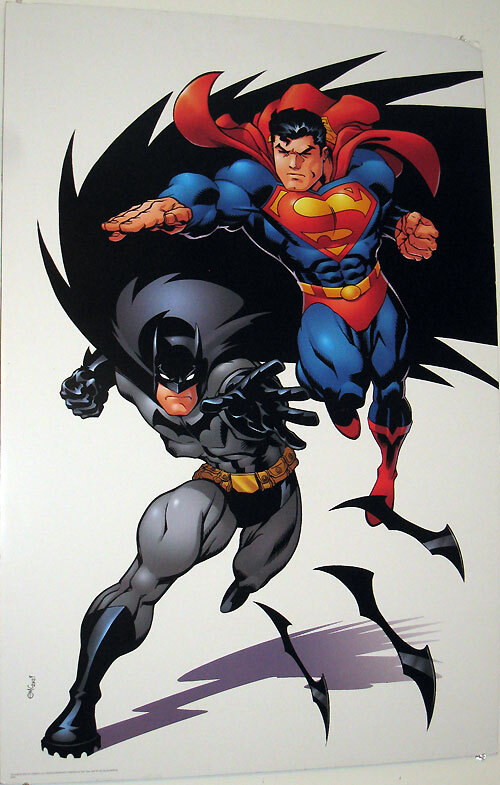 Below is an Ed McGuinness Superman and Batman image from Superman/Batman the comic. 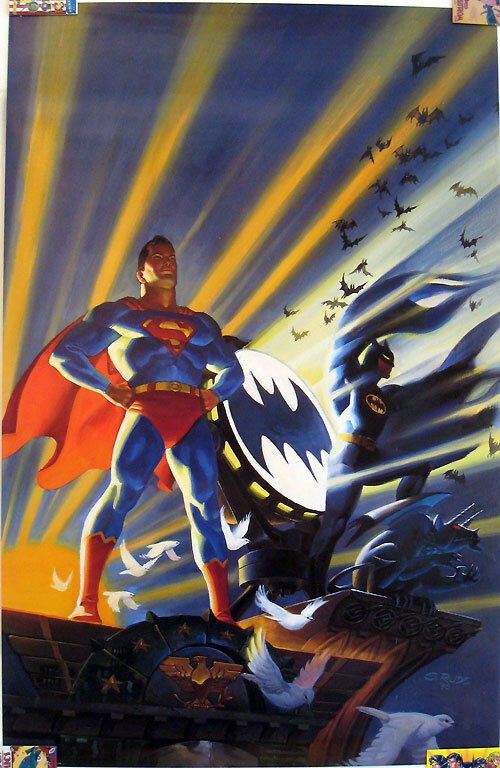 Below is a gorgeous Superman and Batman image from Steve Rude’s 1990 masterpiece World’s Finest. The next two posters are actually flip sides of the same poster, both drawn by Jon Bogdanove. The poster came in a Wizard Magazine special on Zero Hour. 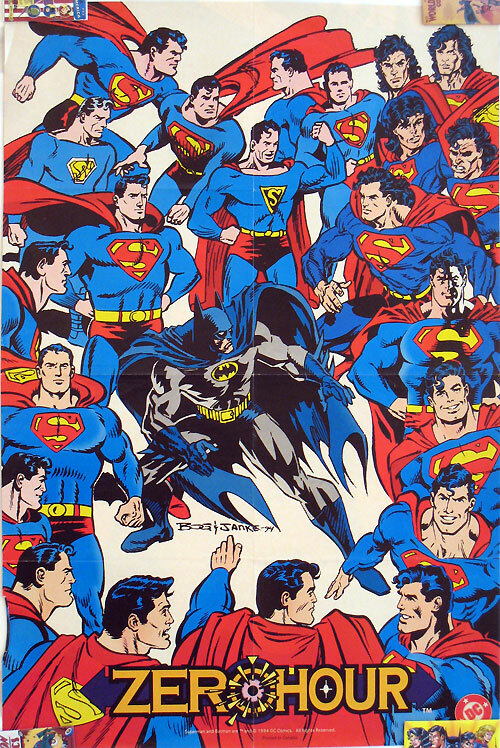 The first side shows Superman surrounded by numerous Batmen, each representing a different artist/era of the caped crusader (i.e. Bob Kane’s Batman, Neal Adams’ Batman, Frank Miller’s Batman, etc). 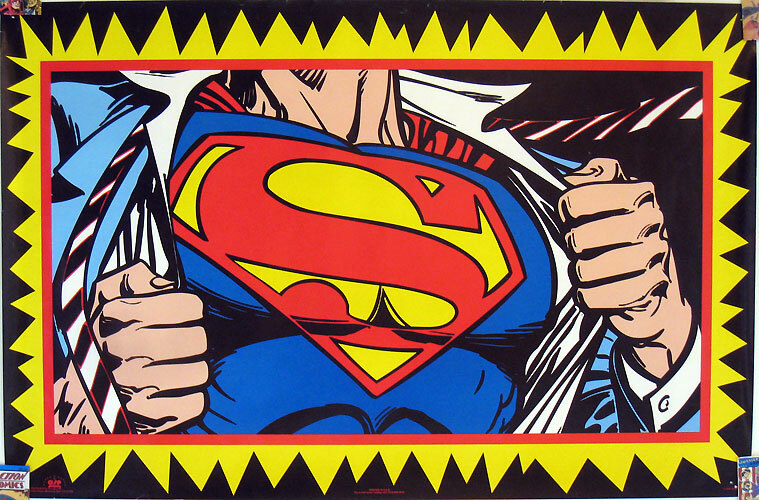 This image was featured as the cover to Superman: The Man of Steel #37 in 1994. 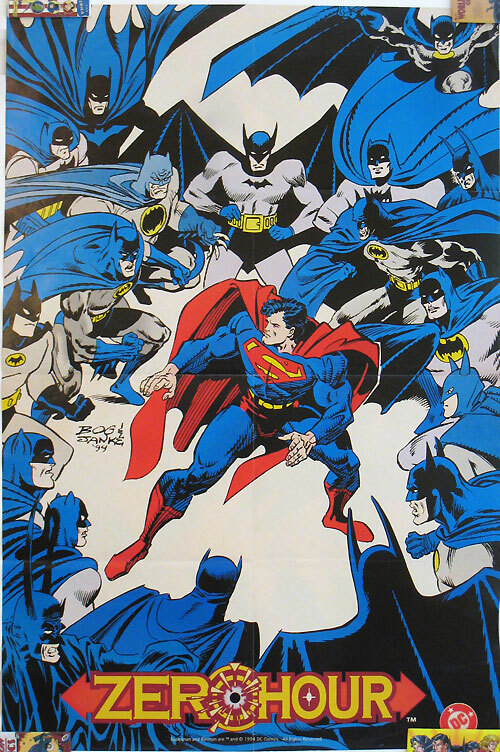 The flip side of that poster features the opposite situation – Batman surrounded by numerous Supermen, each representing a different artist/era of the man of tomorrow (i.e. Joe Shuster’s Superman, John Byrne’s Superman, Wayne Boring’s Superman, etc). This situation didn’t actually appear in the Zero Hour story. To my knowledge, this image has never been available anywhere but this poster. This next one is a nice Clark Kent/Superman moment. Click the image to enlarge. This next poster by Joe DeVito entitled Faster than a Speeding Bullet was released in the mid-90s. 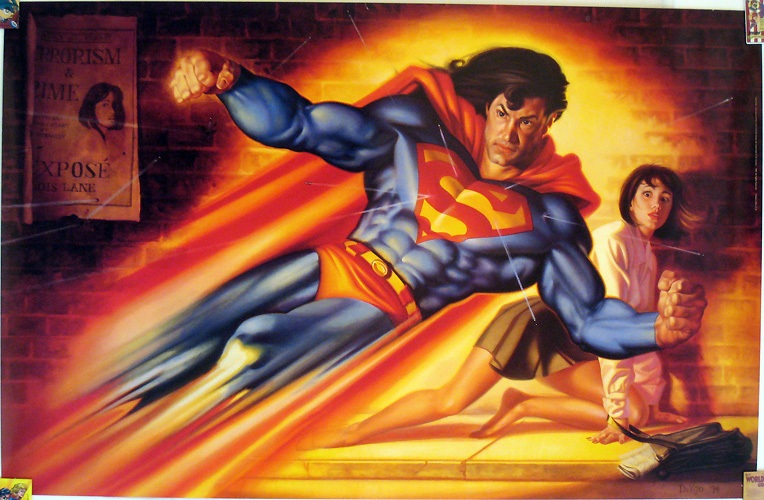 I had this poster hanging up for years and was accused by several girlfriends of keeping it just for the Lois Lane pose. Click the image to enlarge. 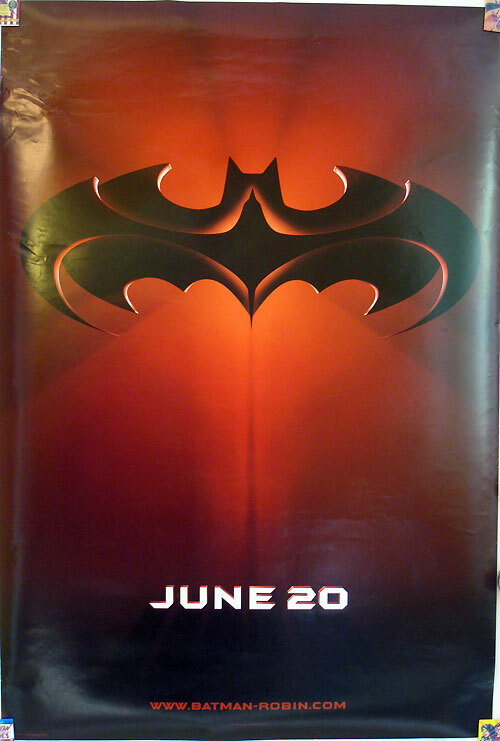 The Alex Ross poster below came out about the same time as Zero Hour. You can tell because certain elements of the poster are clear indicators of the times. Superman’s got long hair, Hawkman is hidden in the shadows because they didn’t want to reveal what was going to happen to the character, and Aquaman still has the harpoon hand and hasn’t traded it in for the hook yet. Click the image to enlarge. 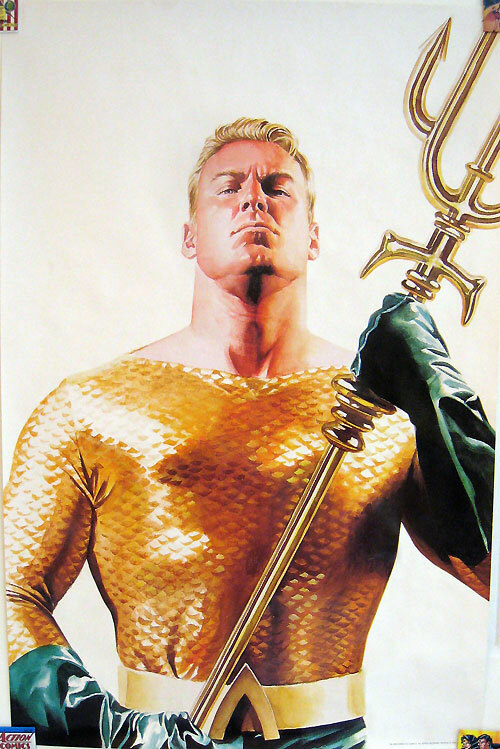 This next Alex Ross Aquaman poster was one of a series of life-size JLA posters. 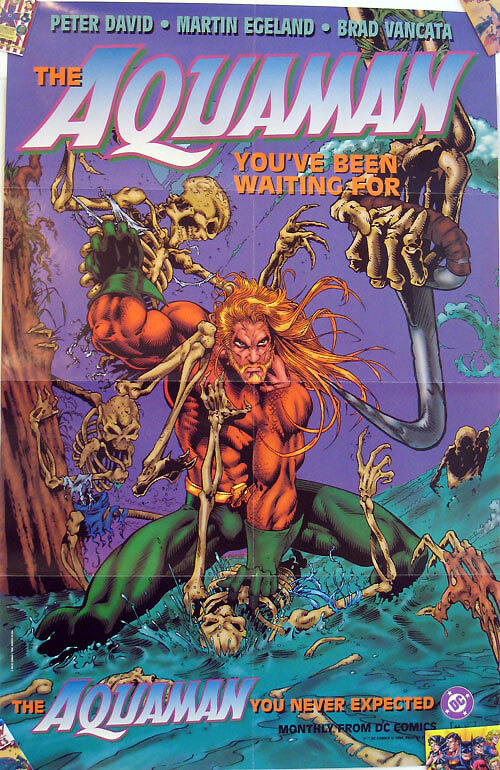 The following Aquaman promotional poster was sent to comic books shops to promote the Peter David and Martin Egeland 1994 series launch. The next Aquaman poster was done by Craig Hamilton. 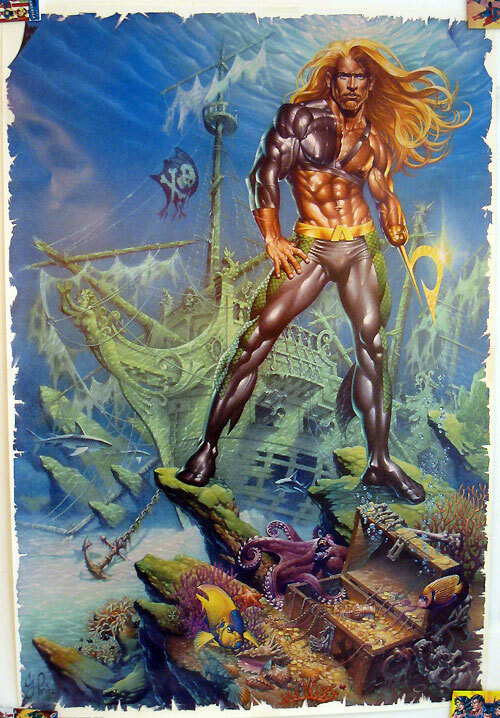 While the art is amazing and the oceanscape is breathtaking, I’ve always felt that Aquaman looks like he belongs on the cover of a Harlequin romance novel. Fabio of the sea! 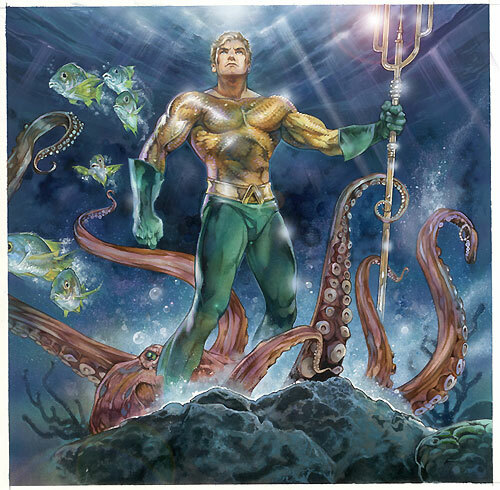 The Aquaman image below was done by Tom Fleming for the VS System card game. This is one of my favorite Aquaman posters! The sea life is gorgeous, Aquaman looks majestic, and the octopus reminds me of Topo. 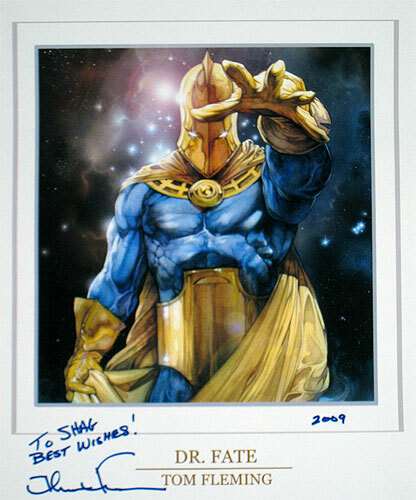 Another Tom Fleming piece, this time it’s Doctor Fate. Really gorgeous piece! One last Tom Fleming piece, this one also for the VS System trading card game. Firestorm the Nuclear Man. Ahhh yeah! The next one is another promotional piece that was sent to comic book stores. 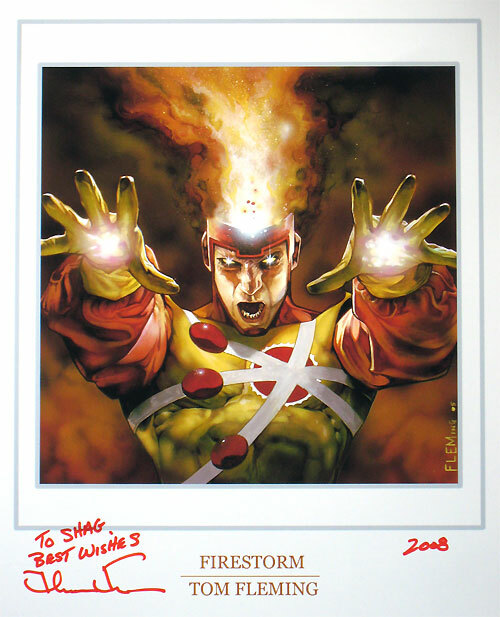 This one was intended to promote the launch of the 2004 Firestorm series by Dan Jolley and ChrisCross. The next two are movie theater one-sheets. A one-sheet is a type of poster sent by a film company for theaters to use in advertising. They are typically larger than regular posters and are two sided. The front has the image you are promoting, the flip side has the same image reversed so it looks good when lit from behind in a theater poster case. In my defense, these next two one-sheets never sullied my walls. I kept them, but never hung them. They are both from the atrocious 1997 film Batman & Robin. Come back tomorrow for more comic book posters. We’ll be looking at the JSA, Flash, Green Lantern, Sandman, Starman, and more! some of those i remember well, some, i can’t recall at all…cheers! I remember that two-sided Zero Hour poster from Wizard very fondly. At the time I was big into Superman and was hoping that we would see the multiple Supermen image used like the Batmen one was, and was disappointed when it didn’t happen. These are fantastic, Shag! I remember most of these fondly. I always dug that pair of Jon Bogdanove pieces with the infinite World’s Finest variations in approximation of various artist’s styles. 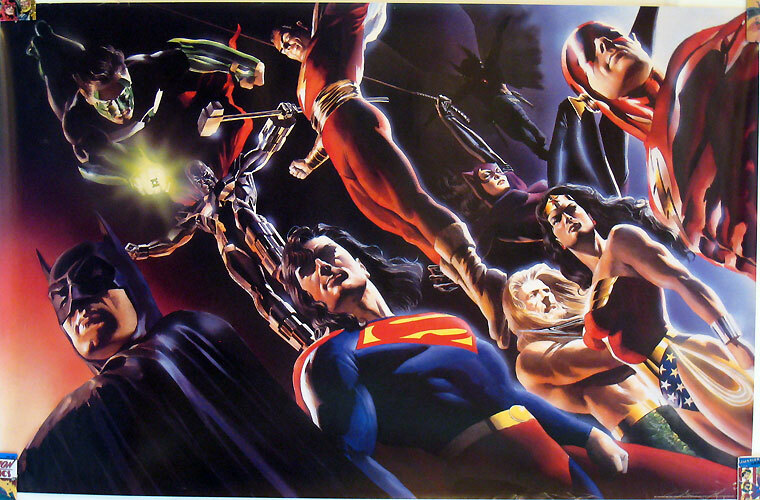 I still own the Alex Ross Zero Hour poster, which hung on my wall for years. I was planning to track down that swell Marty Egelund Aquaman promo, and I owned that Craig Hamilton number for years, but finally sold it out of my first shop. 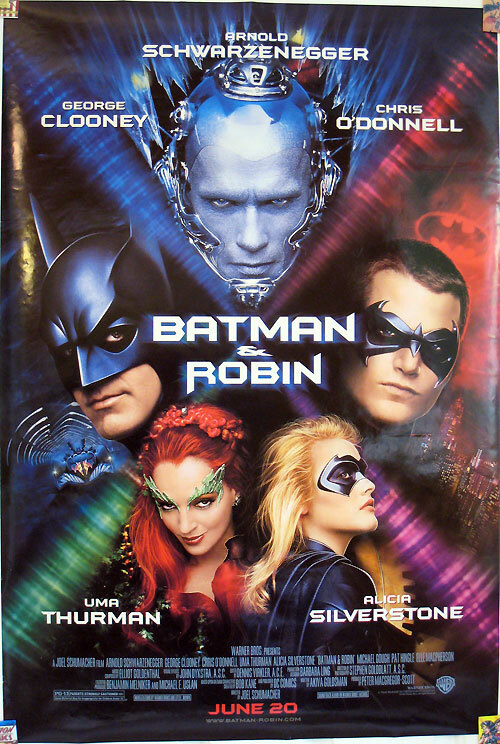 I had a set of Batman Forever character posters I won in a CBLDF raffle at a retailer meerting, but I don’t recall what became of it.